With all stacks, caution is recommended. Nootropics are powerful, and all brains are different, so combining them carelessly may have risks. Always make sure you try out the components individually first to verify that they work as intended for you, and don’t have any unwanted side effects. This is a stack you can take every day, or every workday. It’s meant to increase your daily productivity and output, and your ability to deal with a consistent workload. Taking one capsule of each component of this stack will improve your motivation, focus, and problem solving ability, and reduce your stress levels, for 2 to 4 hours. Taking one stack when you wake up, and then another one during lunch break, should cover your workday nicely. Night owls can instead take one stack when they wake up during lunchtime, and then one at the end of the afternoon. Noopept can have compounding effects, so taking it multiple days in a row makes it more effective. It’s possible to take a third stack during the day, but this can increase the rate at which tolerance builds up. 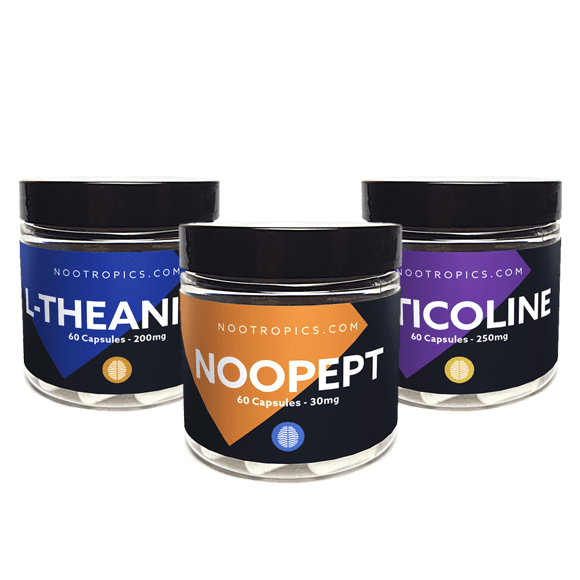 Noopept is the focus of this stack. It increases motivation, concentration and cognitive capacity, and has neuroprotective effects on top of that. L-Theanine is an extract from green tea, which creates an anti-anxiety effect. In this stack its purpose is to reduce stressed feelings, and gracefully deal with any frustrating things that happen in day to day life. It also synergizes very well with coffee, reducing the tenseness that can come with caffeine consumption. It’s possible that you don’t need coffee if you’ve taken Noopept though. Citicoline has modest cognitive benefits by itself, but in this stack it is meant to potentiate the Noopept. The latter interacts with the brain’s acetylcholine system, and taking Citicoline supports this. Citicoline also prevents the headache that can be brought on by Noopept’s interaction with the acetylcholine system. Capsules per day: 1 of each, two or three times per day. If prone to depressive episodes, leave the citicoline out on the first dose. Effect duration: Peak effects for 2 – 4 hours, with residual effects up to 4 hours after that. Extended use: This stack is meant for extended use; daily, or every workday. If tolerance builds up, taking a break for a week can restore potency. For more information please see the individual product pages. If you’re worried that you might be predisposed to depression, leave out the Citicoline until and unless you get a headache. You could also only take the Citicoline with the second dose during the day. An excess of choline can amplify or trigger depressive episodes, and Citicoline is therefore not advised for people with a predisposition for this. Do not consume alcohol if you have taken Noopept. These statements have not been evaluated by the Food and Drug Administration. This stack is not intended to diagnose, treat, cure, or prevent any disease. For further information, see the individual product pages.